Ascend® is touted by Winfield Solutions, LLC, as a “… tool to increase plant efficiency” and “… can stimulate higher yields through a larger root mass …” Ascend® contains the plant growth regulators cytokinin (0.09%), gibberellic acid (0.03%) and indole butyric acid (0.045%). It can be applied at rates of 4.5 to 6 oz/A in-furrow at planting, 2×2 inches below the seed at planting, at 6.4 to 10 oz/A at the 3 to 10 leaf stage, and/or at 6.4 oz/A at the R1-R3 leaf stage. We tested the plant growth regulator Ascend® at eleven locations in Wisconsin by applying it to an adapted hybrid and comparing it to the same hybrid left untreated during 2012 (4 reps) and 2016 (3 reps). The 2012 results have been posted earlier (click here). If there was any growing season when a corn root growth enhancer should work it was during the drought of 2012. During 2012, locations that exhibited significant drought stress included Chippewa Falls, Lancaster, Janesville, Arlington and Fond du Lac. Hancock was an irrigated site. At seven of eleven locations there was no statistical difference when using Ascend®. At three of eleven locations, the untreated plots yielded more than plots treated with Ascend®. At one of eleven locations, Ascend® treated plots yielded more than untreated plots. At none of the sites that had significant drought stress during the growing season did Ascend® stimulate higher yields. Across all locations there was no statistical difference between corn treated with Ascend® (196 bu/A) and untreated corn (200 bu/A). During 2016, we expanded the number of Ascend® treatments to in-furrow and foliar treatments. All were applied within the labelled rates and timings. The 2016 growing season was an ideal season throughout the state. Little stress was observed. We measured no significant yield response using Ascend® plant growth regulator (Table 1). 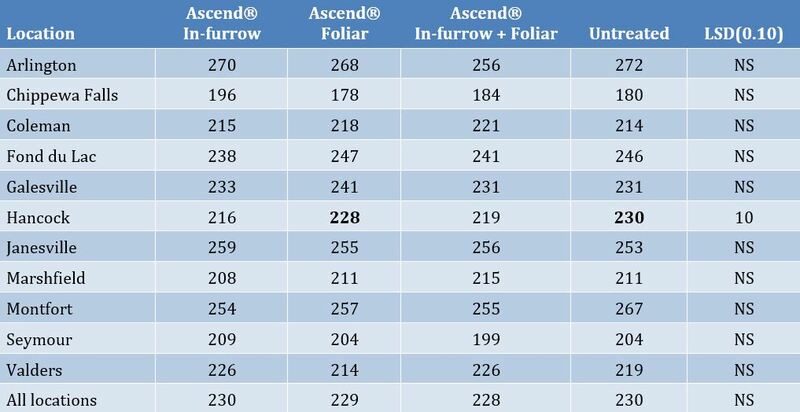 At only one location, Hancock, was there a statistical difference using Ascend® when the control and the Ascend® foliar treatment were higher yielding than the Ascend® in-furrow and Ascend® in-furrow + foliar treatment. Across all locations there was no statistical difference between corn treated with Ascend® (228-230 bu/A) and untreated corn (230 bu/A). No statistical differences were observed for other agronomic measurements (Table 2). Table 1. Corn grain yield (bu/A) response of Ascend® plant growth regulator treatments compared to an untreated check during 2016. Table 2. Agronomic response of Ascend® plant growth regulator treatments compared to an untreated check during 2016. Values are means across 11 locations. *Ascend® is a “buyer beware” product. Across all locations, the yield range due to treatment response is 2 bu/A, with the untreated check as responsive as the best Ascend® treatment.The evidence from 11 locations across two years seems to confirm the conclusion to be “wary” of this product. However, I always encourage people who may want to try it on their farm to do so by buying a small amount and testing it across a few acres. You may find a response on your farm. If you do, you can always buy more next year.